Picking out a new truck is always an exciting undertaking. The new 2017 Dodge RAM Big Horn 1500, available at Melloy Dodge, gives you a lot for your money, and is one of the most comfortable-riding trucks around. And, don't think that comfort means giving up utility. That's the furthest thing from the truth when you drive a Big Horn. 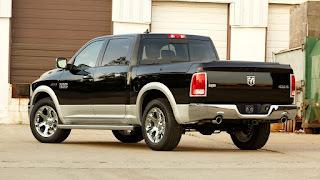 The Melloy Dodge RAM Big Horn features a ton of included packages, including the Big Horn Regional Package, a Class IV receiver hitch, 20-inch chrome clad aluminum wheels, electric shift on demand transfer case, fog lights, front and rear parking assist, a backup camera, remote start, integrated voice command with Bluetooth and more, all in addition to the standard safety and security features, convenience features and entertainment features. Enjoy luxurious comfort, but don't give up the ruggedness of the Big Horn. The 2017 model year features a 5.7-liter Hemi with variable valve timing, an engine oil heat exchanger, heavy-duty engine cooling, a heavy-duty transmission oil cooler and electronically controlled throttle. The engine makes 395 horsepower at 5,600 rpm and 410 pound-feet of torque at 3,950 rpm. The engine is backed by an eight-speed automatic transmission with electronic shift. The Big Horn also adds a trailer brake control and trailer tow mirrors to make towing easier. Protective features include tow hooks, a front suspension skid plate and a transfer case skid plate shield, so if you have to drive out up in the mountains, you'll have less chance of rocks or logs ripping a hole in the oil pan or tearing your suspension off. Visit Melloy Dodge to test drive the 2017 Dodge RAM Big Horn to learn more about all of its features. When it's time for recommended service, Melloy Dodge Service Center will be ready to help you keep up your truck's maintenance.